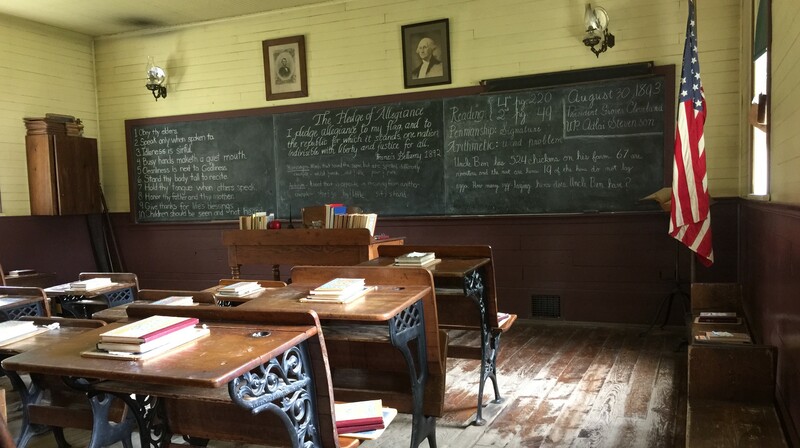 Copenhagen Schoolhouse in Naper Settlement. Naperville, IL. Author’s photograph. The patriotic promise may reflect more about America’s fears at certain moments in history than a stable, verbal vow of duty to one’s country. I pledge allegiance to my Flag and the Republic for which it stands — one nation, indivisible — with liberty and justice for all. “The girls side” of the schoolhouse. Author’s image. 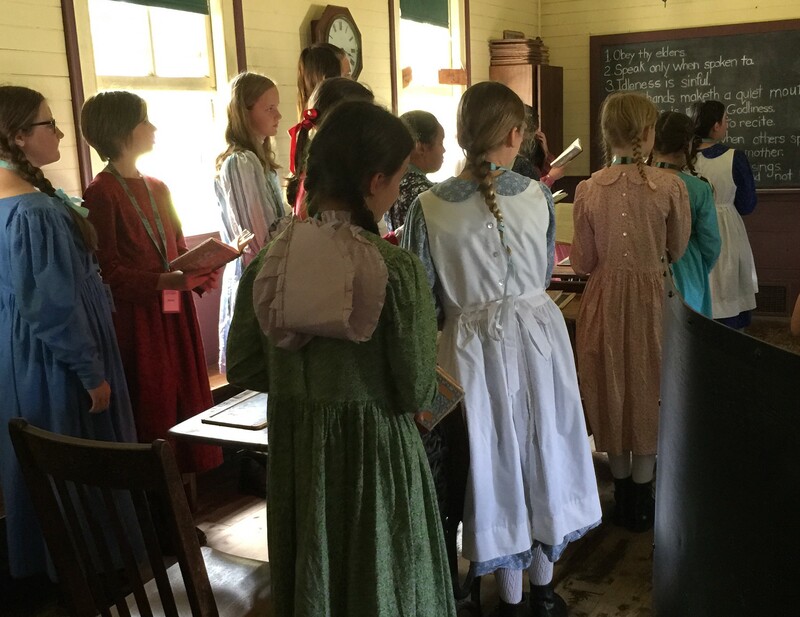 Along with my family, I’m visiting a reconstructed 1840s schoolhouse on the outskirts of Chicago in which volunteers recreate a typical morning of instruction. In here, the year is 1893, Grover Cleveland is President, and the Pledge of Allegiance is barely a year old — and, you’ve likely deduced, quite different from the one most Americans speak today. In fact, what you’ll also notice as you read further is that the Pledge — like virtually all writing and art — reflects more about America (as well as its fears) at certain moments in history than a stable, verbal vow of duty to one’s country and schoolroom. 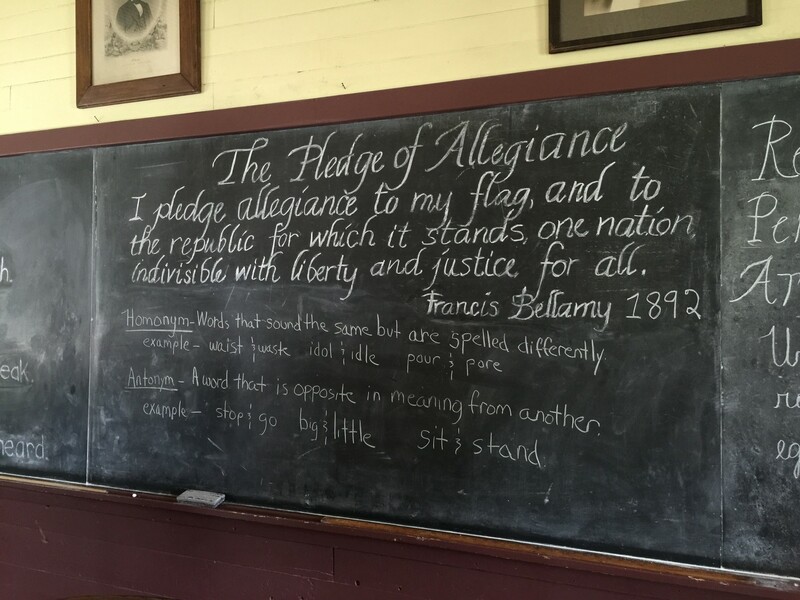 In 1892, a 37-year-old minister named Francis Bellamy pens the Pledge of Allegiance as part of a national patriotic school program, which would coincide with the opening of the Columbian Exposition in Chicago. The plan was for schoolchildren across the country to recite in unison this new promise to the American flag. If you search online for information about the creation of the Pledge of Allegiance, this is mostly what you find: basic information about Bellamy and the Chicago World’s Fair of 1893. But a deeper search reveals a far more xenophobic history. the complacency of post-Civil War Americans oblivious to the dangers facing the country. At the words to my Flag, the right hand is extended gracefully, palm upward, toward the Flag, and remains in this gesture till the end of the affirmation; whereupon all hands immediately drop to the side. Bellamy’s Pledge of Allegiance and his instructions for saluting the flag were published in Youth’s Companion, a Boston-based family magazine with a sizable subscription base and a periodical that…wait for it…offered American flags for purchase. The Pledge’s original form wouldn’t last long, however. The original Pledge of Allegiance, 1892. Image: Liberty Aloud. During the first National Flag Conference, the American Legion and the Daughters of the American Revolution made this change so that immigrant children — who could theoretically be pledging their native land (rather than the U.S.) as they spoke — would be clear as to which flag they were saluting. I pledge allegiance to the Flag of the United States of America and to the Republic for which it stands — one nation, indivisible — with liberty and justice for all. 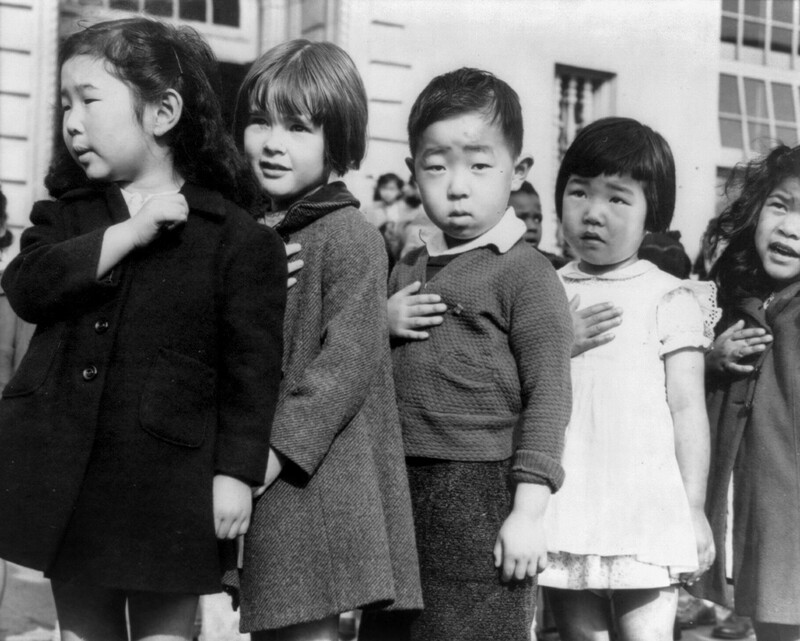 First graders of Japanese ancestry pledging allegiance to the American flag. Photo by Dorothea Lange via Wikipedia. Again, in his book To the Flag: The Unlikely History of the Pledge of Allegiance, Richard J. Ellis explains that by the mid-1930s, Americans had begun to notice eerie similarities between the Bellamy salute and the “Heil Hitler” salute. Then, with the onset of WWII some women’s clubs, parent and teacher organizations, the Red Cross, and the Boys and Girls Scouts, for example, more vocally expressed their concerns about the parallels. 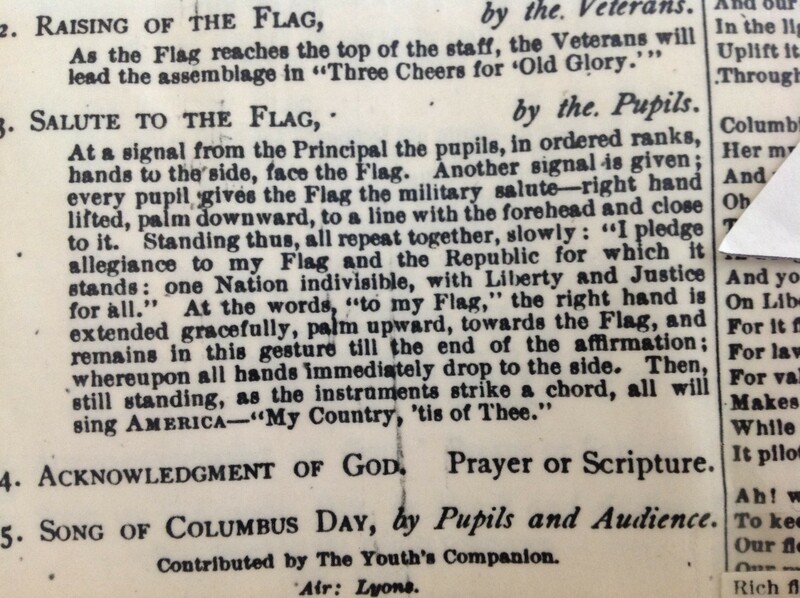 Some schools even revised the salute on their own. 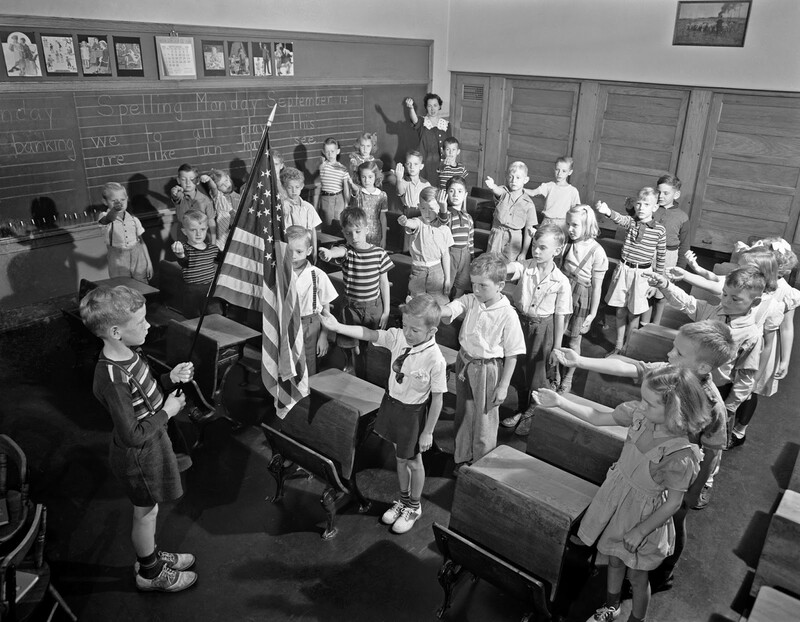 Ellis reports that in September 1939, an elementary school in New Jersey required children to leave their hands on their hearts throughout the Pledge. The Bellamy Salute — not tiny Nazis. Image: History in Photos. The Pledge of Allegiance underwent yet another change in 1954. Responding to the threat of Soviet Communism (again more national fear), President Eisenhower encouraged Congress to add the words under God to the pledge. So, the next time you hear someone express her opinion about the Pledge of Allegiance — We cannot alter the Pledge! No one can take God out of it! — you will know, based on its history, how best to respond. This story was also picked up by Talking Points Memo.